Numeria's capital city of Starfall sprawls in the shadow of the region's most infamous ruin, Silver Mount. Here, the sadistic Technic League and the Black Sovereign rule the land and control access to incredible and dangerous technological wonders, including the mysterious Silver Mount itself. Somewhere deep within that ruined starship, the greatest of the Iron Gods is rising to power. But before the heroes of Numeria can oppose it, they must contend with the Technic League and the Black Sovereign, for these oppressive rulers control access to the legendary site. Will the technological wonders gathered from across Numeria and the clues gleaned from an ancient android oracle be enough for the heroes to prevail, or will they be crushed under the Technic League's metal boot? "Palace of Fallen Stars," a Pathfinder adventure for 13th-level characters, by Tim Hitchcock. A look behind the walls of Starfall, Numeria's dangerous capital city, by Tim Hitchcock. Devotion and danger in the Pathfinder's Journal, by Amber E. Scott. 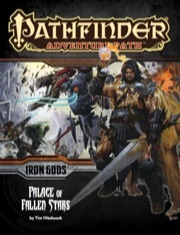 "Palace of Fallen Stars" is sanctioned for use in Pathfinder Society Organized Play. The rules for running this Adventure Path and Chronicle sheet are available as a free download (874 KB zip/PDF). Like Lords of Rust and Valley of the Brain Collectors before it, Palace of Fallen Stars is very much a sandbox adventure. How things play out is almost entirely dependent on the actions of the PCs, from the order of events, to their results, to which NPCs live and which die. It's even technically possible to bypass this adventure and jump to the sixth one before coming back and completing this one (albeit, that way would likely be considerably deadlier). The text does a good job of accounting for the many different possibilities and for how NPCs might react, while never forcing any particular path. All in all, it makes for a very good adventure, one that's going to be very different for every group that plays it. yes! more of this, less of that other! This adventure was a long time coming for some of my players. Those with grudges against the Technic League will finally get their chance to strike back in the heart of Numeria's corruptions and depredations. Starfall offers some truly titanic foes to overcome, but you aren't without friends to make! This is an excellently made adventure for mid level characters, and offers some cathartic moments for enemies of the League or the Black Sovereign. Short Version: Fight the Technic League at its source. There's something magical about AP issues that tackle major elements of the setting. The Black Sovereign, the Technic League, and the city of Starfall are things we've known about for a long time, so including them in this playground is really cool. As someone who cares less about Golarion, this might slip to a 4, but it's still an interesting open adventure with a lot of ways to reach your goals and some great opportunities for roleplaying to take the front seat. If you've been playing this AP since part one I hope you haven't gotten sick of robots because there are a ton of them in here. There is a lot to see and do in Starfall but you will see a lot of weirdness as well. Not as much alien as you encountered with the Dominion but things are not getting to normal any time soon if it ever does. Huh, Zyphus is an interesting choice for a god to detail in this installment. I'm interested in why he was chosen for this part. Also, Black Sovereign hype! I wonder if the Black Sovereign will be the NPC on the final cover? It would be cool to see a picture of him! Somehow I doubt they'd pick anyone else. I may be wrong, but it seems like a no-brainer. Also, growing more excited with every new product announcement. Congrats to Tim Hitchcock getting the penultimate adventure! Numeria's entire theme is based around a crash. A crash is an accident. Zyphus is the god of Accidents. While I'm sure it won't, but will future deity write-ups include the Obediences found in Inner Gods? Would love some for Zyphus! Yes. We're including all that info for the deities in the articles going forward, starting with Brigh in the 2nd Iron Gods installment. So his appearance in this issue is no accident. Doesn't that create some kind of paradox where he ceases to exist? An Android oracle, eh.... That's interesting. Curious what kind of mystery they would have, though. Lore maybe? A new one based round technology? Meh... This one doesn't seem to have the wow factor the previous volumes evoked in me. Its probablely the bonus articles, But as usual, I will reserve judgement until I have read the whole thing. Interesting choice of artwork. Wasn't that in one of the older books back in like 2008 or 2009, detailing Numeria? If I recall correctly, according to the book that's just an enforcer for the technic league. The character himself is in the Inner Sea World Guide, listed as "Technic League Captain." This is still mockup art... but that guy in particular is indeed a specific character of great importance in the Technic League. This one is a guaranteed purchase for me. Zyphus is one of the four most beloved Deities of the setting at my table, and more information on him can't come soon enough! Regarding this adventure path, I'm not sure whether to say "Lords of Light!" or "Mathematical!" Oh man, now I'm wondering after reading the Numeria book if he's the lord of the technic league. Magus. Totally badass techno interpretation of a friggin Magus. Holy crap if that's how you can make one look I may have to play one g+#+~&mit! When will we see the final volume of Iron Gods displayed on the website? Probably not until the day of Gencon where they do the future of Paizo seminar, when you can also expect to see at least Giantslayer #1 (and maybe 1-5) go up, among other things. Plus or minus a few days, I think. Don't you mean January? Cause that's not up yet. If the final art for this is not released soon I will unsubcribe from all of my subscriptions and never buy another product from Paizo again. Eh. None of those are admissable in court. Wow. Looks like Conan of Golarion! Nice cover art and it does remind me of Conan. I'm guessing that awesome looking barbarian fellow is the Black Sovereign? Is he wearing a Manticore skin cloak? Where's the glowy green light sword? It's a null blade. Page 26 of the Technology Guide. It seems Wayne Reynolds is really showing off his A-game. I'm loving these layout choices. My vision-impaired players are not digging the thin lettering inside, but otherwise I have no nitpicks. Love the artwork all around. What do your players have to look at on the inside? Technically not in the APs, the lettering within the player's guide is also the same style set. The map of Torch in particular, with the location key of named sites, is almost completely illegible for them. I plan on buying the map folio, which will help this obstacle - but we will have left Torch by then, I think. ;) In any case, it's just a consideration I want to point out. Clearly, thin lettering is within the SciFi theme, and conserves space - so it's a matter of balance, and I just wanted to point it out. OK I get what you mean, although I think the main font is the same as always. Why must Pacific Time December 17 be two weeks away? So anyone got there PDF copy of this yet and willing to give some spoilers? No, but I got my "will be shipping soon" email. I have also received my 'shipping soon' email. I've got my PDFs. I can field some questions. Who are the NPC'S in the appendix? What are the monsters in the bestiary? Is the plot an infiltration or more gather an army and storm the place deal? Appendix: Ghartone (Technic League agent), Kevoth-Kul (The Black Sovereign), Ozmyn Zaidow (Technic League leader). Bestiary: Gammenore (giant cold crab), Gravedagger (herald of Zyphus), Juggernaut Robot (big, bipedal), Surgeon Robot. Plot: I'll have to get back to you on that once I've had an opportunity to skim over it more.